Jeanne-Marie Derrick is certified in Iyengar Yoga. She was introduced to Iyengar Yoga in 1983 and realized immediately the teachings of yoga, related philosophies and therapies offer a sincere practitioner the ability to overcome tribulations and find contentment, peace and joy while having fun. Therapeutic Yoga has been a core focus for Jeanne-Marie through her practice and as a yoga instructor. Yoga and therapeutics become analogous, as one understands more about the classical teaching and practice of yoga. 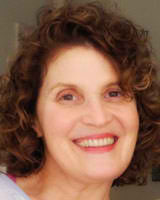 Jeanne-Marie has taught many workshops and teacher trainings both nationally and internationally. She also studies and practices Ayurveda and has extensive anatomical and physiological knowledge. Jeanne-Marie spent many years studying Women’s Yoga. She wrote a book in 2001: Yoga for Menstruation; a Practice Guide, in which she illustrated and elaborated Geeta Iyengar’s teachings on women’s yoga. Jeanne-Marie has another love and occupation of art and painting. Jeanne-Marie is available for private yoga sessions in both New York City and Philadelphia and the surrounding area.